Lucifox Reading Extensions And How Browsers Are The Next Readers..! 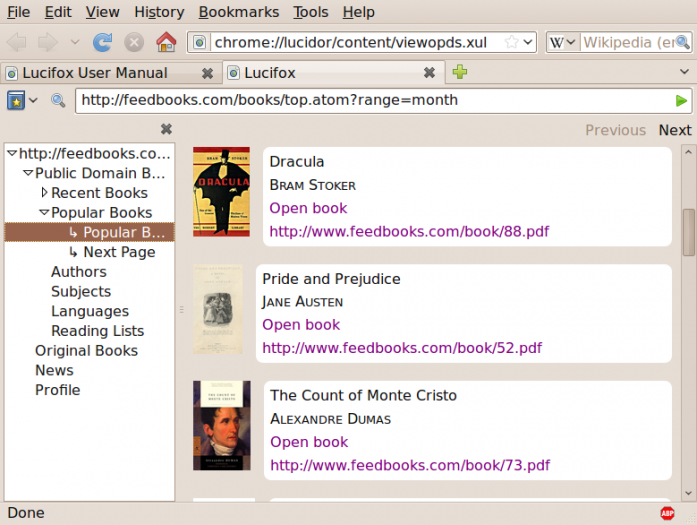 Lucifox Reading Extensions And How Browsers Are The Next eBook Readers..! Until this point, we have always considered eBook readers as a separate entity. Something which is distinct from all the other devices. Of course, working wise they were pretty different. The fact that they did only one purpose that is to read eBooks made them special. For a long time in the digital world, there were machines which only did one particular task. Rather than all. Thus, you had separate tools for writing the text, editing it, compiling it and making it press. You would have to use all the tools in tandem to get the project take a form. Furthermore, You had experts who operated these fields. Also, You could plainly leave it to them, and they’d deliver without fail. However, as the age of publishing progressed, you had tools which were more complex than ever. Lucifox extension being one of them. As seen above, the tools became more complex. But then this allowed for more innovation. The digital age was indeed entering the golden phase which combined technology with ease of use. Now a single tool could do the work of almost ten others. Also, the formats improved and got the readers to involve much more while they were reading. At the start of 90’s, eBook and eText reading through formats like ePub, Mobi, and PDF became the next cool thing to do. People started lapping up the idea of carrying thousands of books in their pockets. With so much convenience, individuals and publishing companies started pushing the limits. Their aim was to make the eBooks to be available on each and every device. And by this, they aimed to bring the eBooks to every platform as well. Of course, you had the readers for each system, Windows, Mac or otherwise; it wasn’t enough. The next obvious idea was to bring the eBook culture to internet browsers. Now there was a clear logic to it. The age was such that, most of the youth was spending high time on Internet browsers. They started with Internet Explorer, went onto embark on Mozilla Firefox and the recent game changer Google Chrome. With the current browsers becoming all the more powerful with added flash capabilities, you can practically do anything with them. From playing complex games, to play videos online, you can practically do anything. Most of this features are brought to the browsers with the help of Add-Ons and Extensions. Most of these Add-Ons are the third party and lend high support for the browsers. This case is similar to that in Chrome’s biggest rival, Mozilla Firefox. It also adopts many extensions which make your browsing and utilizing the browser to be of significant effect. One of the extensions which allow you to read eBooks easily is LuciFox reader.This extension is available for free in Mozilla store online and gives you all the importance to open epub files. Lucifox is a free and open source add-on for the browser Mozilla Firefox that organizes, saves and manages ebooks, supporting EPUB 3 and EPUB 2 formatted books without DRM. It also supports the retrieval of books from on-line book catalogs using the Open Publication Distribution System (OPDS). It is part of the Lucidor suite of free and open source ebook software made by the Swedish developer Ordbrand. You can get this extension from Mozilla shop online. Within few seconds you have the extension blinking on the browser window. Lucifox opens in the main browser window and displays some on-line book catalogs, from which the reader can search for and download books. The list of bookstores that you want to visit and buy from can be changed easily. You can change the book links as well so that you don’t end up reading or visiting the same library all the time. Also, and extended by the user. It displays a book to the reader using the browser’s main window, one book per browser tab. The book can be on-line or saved off-line on a personal bookshelf folder. Lucifox remembers where the reader stopped reading, so reading can be resumed at a later time. You can navigate the book’s content by scrolling up or down a page. Also, You can move forward or backward using arrow buttons. Use the left panel to traverse the book’s hypertext index too. You can use Lucifox to support annotations that can point to several places in the text. In addition to this, you can export these annotations into an annotation file. Further, you can import these annotations into another reader’s copy of the book. This way you can get to sharing notes. However, Lucifox can also search for terms in the book text, with hits being displayed in the left panel as clickable hyperlinks. Lucifox draws advantages from Firefox’s support for a large number of open web standards, These features in addition to regular text makes it possible to display ebooks with advanced content. We are talking about the enhanced eBooks features which are often found for some concepts where need be. Enhanced eBooks are often found in textbooks, like mathematics, music notation, chemistry, and even interactive 3D. The examples in line may include, letting the reader rotate a chemical molecule. You can also use Lucifox, to let a reader compile their ebook from online sources, as it comes with a book generator. No longer do you have to depend on offline tools like Calibre, Sigil or Scrivener to compile your eBooks. Thus, Lucifox is available on all regular computers where Firefox is available, among these are GNU/Linux, Microsoft Windows, and Mac OS. Once you install Lucifox, it is available from the browser’s extension bar, indicated by a red star, which can be moved by the user, or from the Tool menu. 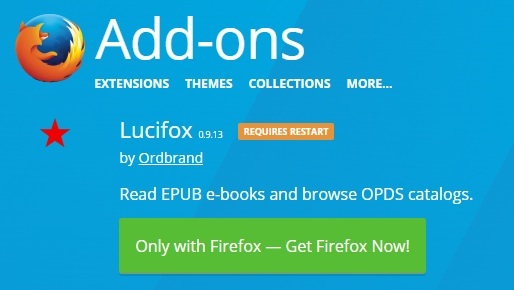 However, since Lucifox is built as an add-on using XUL, it is not compatible with Firefox on Android, and at present, there is no Lucifox ebook reader for Firefox on Android add-on. You will have no trouble opening ePub and ePub3 formats which Lucifox supports on the go. You may find that it opens the basic formats of PDF, as well, but such instances are far and few in between. We are just scraping the surface when we talk about browser extensions today. With Lucifox becoming an excellent solution for everyone who wants to use Firefox to read eBooks we are looking to the next step of evolution. Of course, enhanced eBooks which do the reading all the more involving are the name of the game. If you are a publisher who is looking to bring out your work with the best form possible, you would need a professional publishing services company by your side. Drop us a mail, and we promise to bring your work out to the world, in the way it deserves.